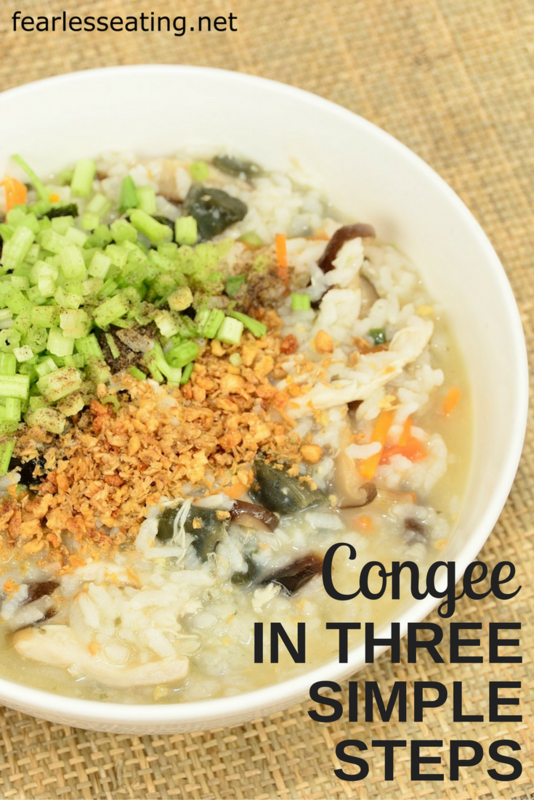 Congee is basically the oatmeal of Asia. But instead of oats, it’s made with rice. The rice is cooked in broth for an extended period which breaks it down and turns it into a porridge-like consistency. From that simple foundation almost anything can be added and the bewildering variety of congee dishes across Asia is a testament to its versatility. Prepared at home from fresh ingredients and your own homemade bone broth, congee is a perfect example of a meal that is not only healthy but affordable too! In fact, it’s commonly considered food for the poor in Asia. But keep in mind lobster was once known as food for the poor too. With the recent craze over bone broth, congee may very well become the next pricey food trend here in the US. Even more reason to learn to make it at home before you have to shell out top dollar for it! 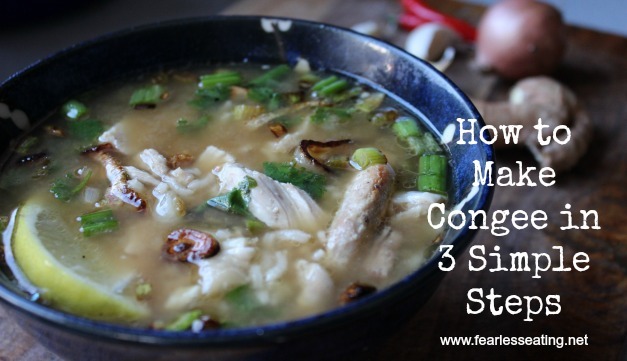 So let me show you the basic 3-step formula for how to make congee. First, rinse the rice in water a few times to wash away extra starch which could make the congee too thick and starchy. Next, decide on the amount of broth and rice you’re going to use. The ratio of the broth to the rice and the length of time you cook it will determine its consistency and texture. There’s no absolute rule for this. It just depends how you like it. It may also take some experimentation to find what you like. For a cup of white rice, add anywhere from 2-4 quarts of broth. Generally speaking, you want to cook the rice for about one to one and a half hours. At that time, 2 quarts of broth will give a fairly thick consistency similar to oatmeal and 4 quarts will be more like the consistency of soup. Personally, I prefer the latter. Now remember, we’re not cooking a side of fluffy, tender rice here so don’t be afraid to cook this until the rice starts to break apart and lose its shape. You may even go as long as two to two and a half hours. Just keep an eye on it until you get the desired texture and consistency. And don’t worry if it turns out too thick or thin. You can always readjust the consistency on by adding more broth to thin it out or cooking it down to thicken it further. To cook the rice, bring the broth to a boil and then reduce the heat and cook at rolling boil, stirring on occasion to prevent sticking. Keep the lid on the pot but leave it slightly ajar to let steam escape. Now just a heads up. The ratios above will make A LOT of congee. You may want to start out with less. Totally fine. But eventually, I would recommend making a large batch. The reason of course, is that, one large batch can be reused throughout the week. Sure beats cooking a single serving for an hour each time! Also, because this larger batch is essentially just rice cooked in broth, you can then transfer single servings to a separate pot and then use steps 2-4 below to create a wide variety of different recipes. Once you have the rice ready, everything else comes together very quickly. Almost any type of vegetable will work in a congee. Some vegetables you may want to saute separately in some oil to bring out a more depths of flavor. It’s totally up to you. Usually, time is what dictates what I’ll add. If I’m in a rush, I plop everything in the broth and simmer for a few minutes. If I have a little more time, I might cook up some veggies separately. The same could be said for different proteins. Congees work well with all types of meats as well as eggs. This is where the congee magic really happens. Salt, soy sauce, fish sauce and sriracha are common additions that instantly transform a rather plain-tasting congee into something bursting with flavor. As for herbs, it’s hard to go wrong with things like cilantro, chives, parsley, thyme and oregano. Optional Step 4. Top with fried garlic, scallions, and or shallots/onions. This is optional but I HIGHLY recommend it as it works in almost any congee recipe. Fry until browned and crispy but not blackened. These will add not only a nice crunch to complement the congee but also some wonderful smoky flavors too. For all of these recipes, the serving size is for one bowl. For one serving, transfer already prepared congee from step 1 above to a separate pot for heating and/or adding ingredients. Adjust serving size as needed. After that, you’re just 3 short steps away from a beautiful bowl of congee heaven. Also, it’s implied that every recipe will be greatly enhanced by adding some fried garlic and scallions or shallots/onions! Step 1. Add ginger, garlic and optional chili to congee and simmer for 5 – 10 minutes. Step 2. Add chicken and simmer a minute or two until heated. Step 3. Season to taste with soy sauce. Add optional lemon, sesame oil and/or sriracha, to taste. Top with cilantro. Step 1. Add coconut milk and curry powder to congee and simmer a few minutes. Add more coconut milk and curry powder, to taste. Step 2. Add sweet potatoes and optional tomatoes and cook a few minutes. If using uncooked sweet potatoes, simmer about 10-15 minutes until cooked through. Add more broth, if needed. Step 3. Salt to taste. Of course, the key element in all of this is making homemade broths! And while even the best store-bought broth is OK, it’s still nothing compared to making them yourself. Properly made homemade broths are both richer in nutrients and much cheaper on the wallet. 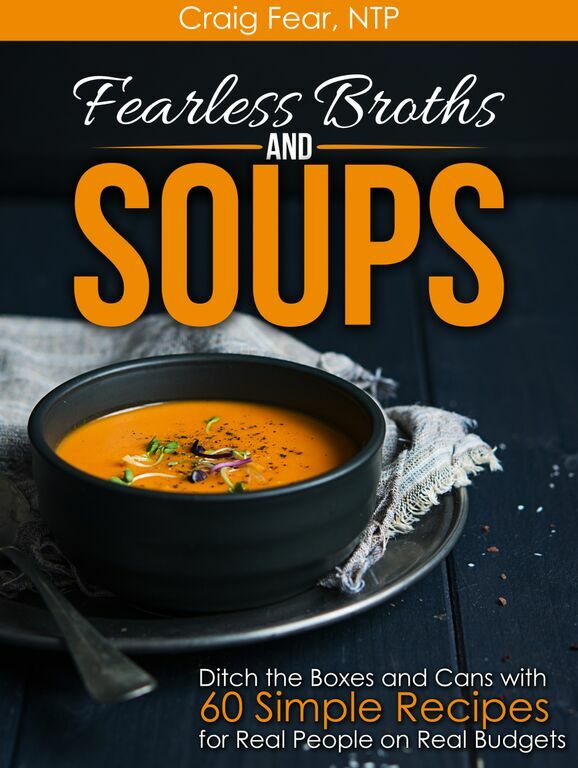 My new book, Fearless Broths and Soups, is now available and will show you how to make REAL bone broths at home! 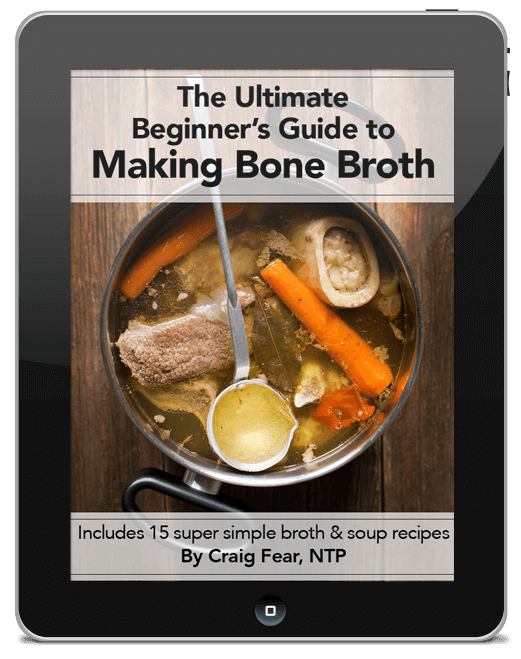 It includes super simple recipes for basic homemade broths such as chicken, beef and fish. And it includes an entire section with 4 chapters on simple ways to use broth for breakfast, including some additional congee recipes.